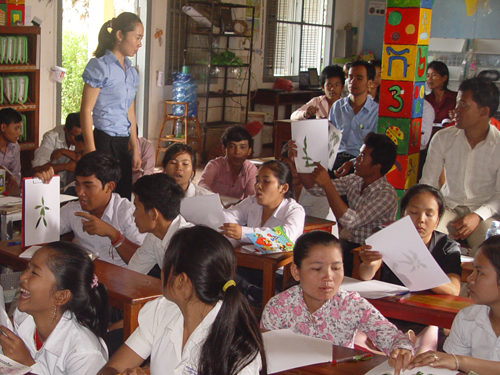 Earlier this month, PEPY’s summer Literacy Camp returned to Chanleas Dai commune. Similar to previous years, the camp design provided learning opportunities for students and teachers alike. During the first week, about 60 teachers and educators from local primary schools and volunteer groups arrived to discuss and develop activities and lesson plans that encouraged students to use their creative and critical thinking skills. In the second week, these educators were able to implement these new activities as over 440 students from Grades 2-5 crammed into two of the primary schools. Instead of grouping students by their normal grade level, students were divided into teams based on their performance on an assessment test that was given at the start of the camp. This way, teachers could tailor their curriculum to a class that moved at about the same pace. Each team formed an identity with a special team name as well as a song. Some of the team names included Team Gecko, Team Magic Bell, and Team Diamond Mask. While this year’s program maintained the traditional Literacy Camp framework, the PEPY staff did add a few exciting elements to the agenda. For the first time, students participated in a cultural parade around the villages. One group of students, for example, used arts and crafts materials to replicate native attire worn by minority tribes in Ratanakiri province in northeast Cambodia. Other students were able to showcase their songs and creative work to parents and community members through an open house celebration. There was even a Buddhist monk who made a special appearance and gave a creative art demonstration. While persistent flooding and consequent road damage did impact attendance rates and some of the planned outdoor activities, participants viewed the camp as a very positive experience. By encouraging a combination of interactive exercises, teamwork, sharing, and a bit of fun, the Literacy Camp will hopefully influence how principals, teachers, parents, and students approach the idea of learning in the upcoming school year.